Psoriasis on the scalp is a common problem many people suffer from. This not only can be uncomfortable due to the itchiness it can cause, but it can be difficult to heal sometimes. However, thanks to many psoriasis shampoos, this issue can be quickly healed. This article will explore more behind psoriasis and some of the best shampoos for psoriasis you can use. To find out more, keep reading. What is the Best Shampoo for Psoriasis of the Scalp? Psoriasis is a condition when the skin cells dry up and build-up on each other to form thick layers of itchy skin. Eventually, it can cause severe rashes which can lead to extreme itchiness and peeling of the skin. This problem can occur anywhere on the body, especially the scalp. There are many benefits that come with using a psoriasis shampoo. Below are some of the best ones. Because psoriasis can cause rashes and itchiness, it can cause hair loss. This is because the hair follicles are loosened and any scratching you do can irritate the area leading to loss of hair. With a psoriasis shampoo, this problem can be stopped because it will stop the irritations that lead to hair loss. Some even contain DHT blockers which can stop hormones in your scalp from causing extreme hair loss. Another great thing about a psoriasis shampoo is that it will hydrate your scalp. This will not only stop psoriasis, but help to make your scalp feel great. This is all due to the moisturizing ingredients in many of these shampoos, like coconut oil and argan oil. Most psoriasis shampoos contain many natural ingredients, like tea tree oil and aloe vera, to help heal the symptoms of this medical problem. Because of this, you don’t need to worry about massaging harmful chemicals into your hair, like sulfates, which could lead to even more painful symptoms. Before you shop for a psoriasis shampoo, you’ll want to keep a few things in mind. You’ll find some important aspects to consider below. Coal tar is an important ingredient to look for in a psoriasis shampoo. Coal tar is known for coating the scalp which can help with stopping the growth of skin cells. This can help with preventing your body from over-producing skin cells which can lead to stronger psoriasis symptoms. It also is known for helping to stop inflammation and itchiness. Due to this, a coal tar shampoo for psoriasis is ideal. However, if you have extremely sensitive skin, it might be best to look for ingredients like aloe vera and coconut oil. Coal tar can be very irritating to those with sensitive skin and could make the problem worse. While aloe vera and coconut oil won’t necessarily work as quickly as coal tar, they can give you the same relief. You should also look to see if a shampoo comes with a conditioner. The conditioner will help with hydrating your hair while also helping to add extra vitamins and minerals to your scalp and hair. 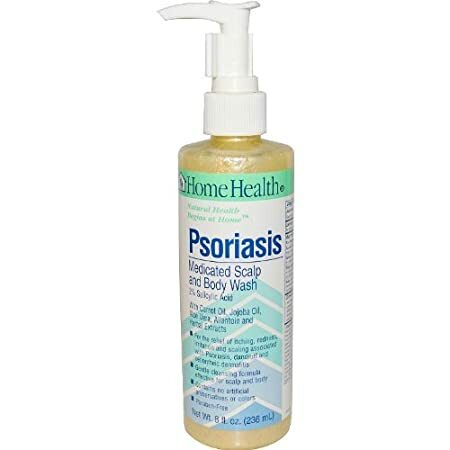 Sometimes psoriasis shampoos can be a little strong for those who have sensitive skin. Because of this, you’ll want to check to see if it’s hypoallergenic. To help with this, check to see if it’s fragrance-free and sulfate/paraben-free. For most shampoos, you need to use it a few times before you start to see results. However, when you have psoriasis, you more than likely want to see results quickly. When you’re shopping for a psoriasis shampoo, make sure to see how often you have to use it before results are seen. If you have to wait for a few weeks, it might not be worth the investment compared to something that will give you results within a few days. It’s difficult to pinpoint the shampoo for psoriasis of the scalp as most shampoos are designed to help with various problems that psoriasis can cause. 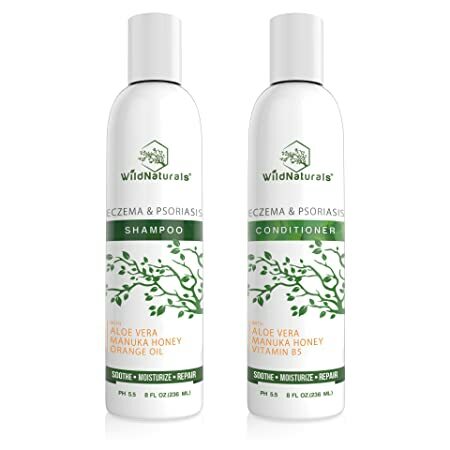 However, there are a few top products that you can consider buying if you’re looking for the best shampoo for psoriasis. 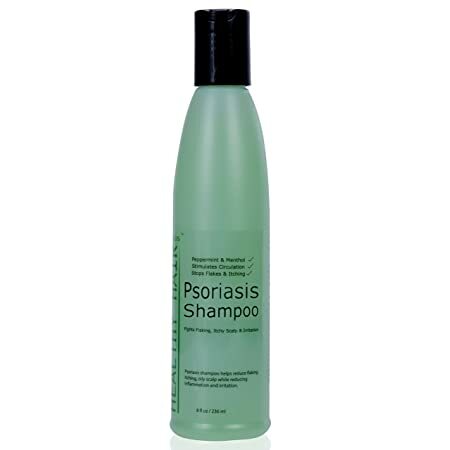 The MG217 Psoriasis Shampoo is the best otc shampoo for psoriasis. This is because this medicated shampoo has high levels of coal tar and uses herbs to help with stopping the symptoms of psoriasis. Better yet, it’s also affordable. The Wild Naturals Psoriasis Shampoo and Conditioner is an organic option and is free from harmful chemicals like parabens and sulfates. This also contains soothing ingredients like aloe vera and Manuka honey which can provide quick relief to your scalp. 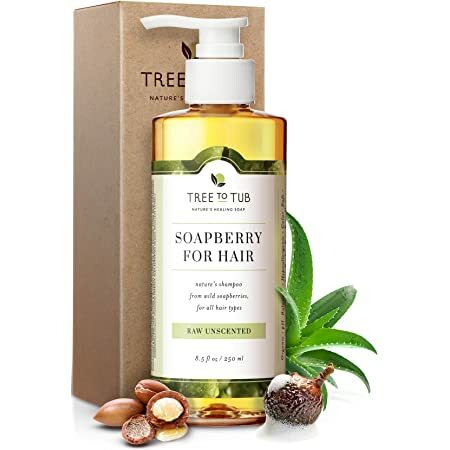 The best natural shampoo for psoriasis is the Tree to Tub Sensitive Scalp Shampoo. While a little pricey, it contains many natural ingredients like wild soapberries and olive leaves to provide relief from psoriasis and other similar problems. 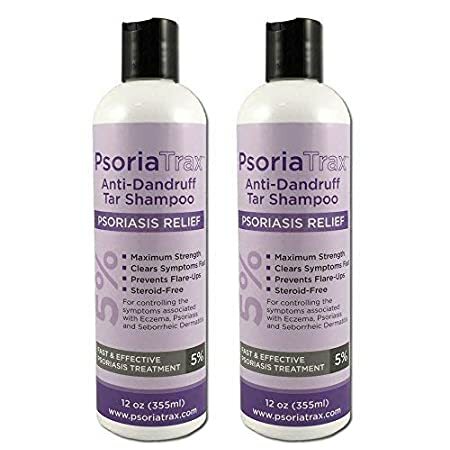 This shampoo by Psoriatrax is made with a 25% coal tar solution designed to help heal psoriasis, dandruff, and other similar problems. This shampoo works quickly and is good for even the worse cases of psoriasis. This product comes with two bottles which weigh 12 oz. each. However, it’s important to keep the shampoo in for about 1-2 minutes each time you use it for best results. 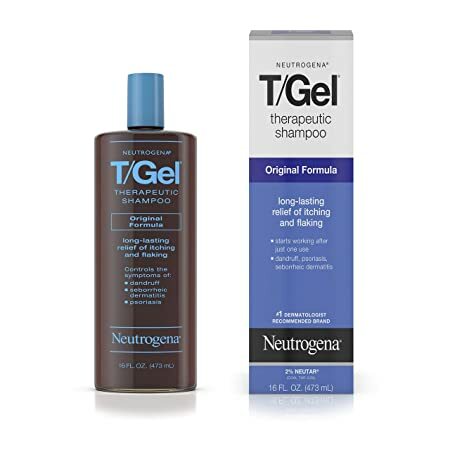 The Neutrogena T/Gel Shampoo is a therapeutic option designed to help hydrate and heal your scalp. This long-lasting shampoo comes in a 15 oz. bottle and contains many helpful ingredients like coal tar and aloe vera. This affordable shampoo has a soft scent and can even help with the irritating itchiness that psoriasis can cause. The shampoo is safe to use on color-treated hair and has a soft scent so there’s no need to worry about it leaving behind a strong fragrance. This shampoo should be used about two times per week for best results. The Tree to Tub Sensitive Scalp Shampoo is a bit expensive, but it’s packed with powerful ingredients to heal psoriasis. This hypoallergenic option comes in an 8.5 oz. bottle and features organic argan oil, aloe vera, olive leaf extract, and wild soapberries to help with stopping inflammation and dry skin. This option is free from sulfates and also contains a unique pH balancing formula which can help with circulation in the scalp. The shampoo comes with a pump on the top which works to make it easier for you to use it. 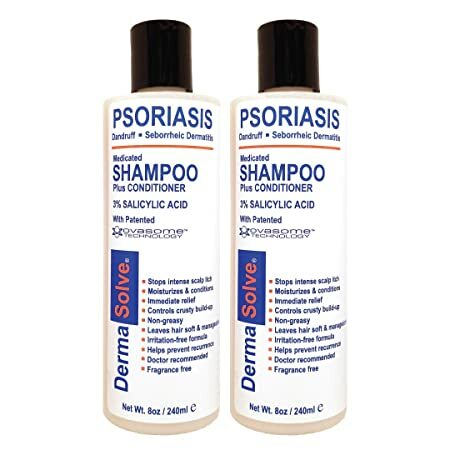 This psoriasis shampoo by Dermasolve some in a two pack which includes a conditioner. The shampoo is fragrance-free and works quickly to help stop dryness and redness. In addition to this, the shampoo is packed with vitamins and minerals to help with maintaining a healthy scalp and hair growth. This option is safe to use on color-treated hair. 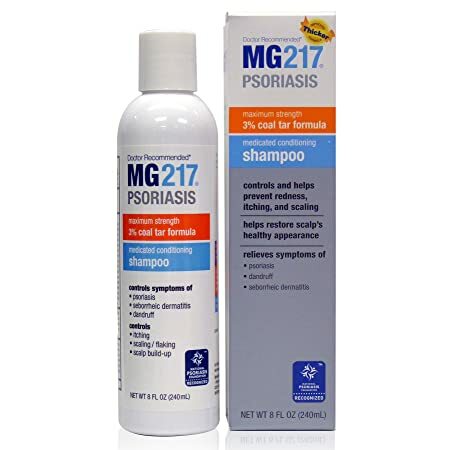 The MG217 Psoriasis Shampoo is an affordable option that comes in an 8 oz. bottle. The shampoo’s formula contains 3% coal tar extract which works to help strip your scalp of harmful particles that cause psoriasis. Besides this, this product will also help with stopping dandruff while giving you soft and shiny hair. The shampoo works strongly, but keep in mind it does contain parabens. 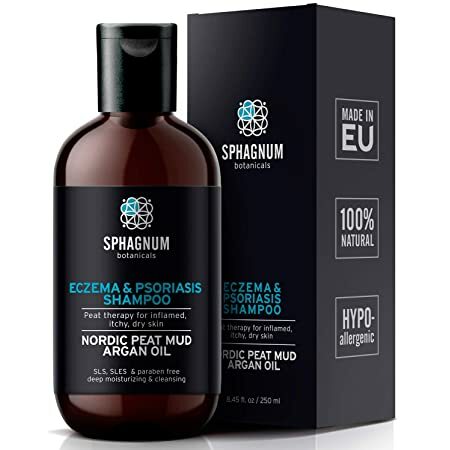 The Sphagnum Botanicals Psoriasis Shampoo contains peat mud and argan oil to help with problems like psoriasis, eczema, and dandruff. This vegan option will work to remove dead skin cells from your scalp while also moisturizing it to stop itchiness and bacterial growth on the scalp. The shampoo is hypoallergenic making it safe for those who have sensitive skin to use. This sulfate-free shampoo is safe to use on color-treated hair but keep in mind it’s a bit expensive. This organic shampoo comes in a 16 oz. bottle uses coal tar, argan oil, and jojoba oil to hydrate your scalp and stop psoriasis and eczema. These ingredients will also help with giving your hair a beautiful shine and volume after you massage it in. This shampoo is free from sulfates and parabens although keep in mind its odor might not be the most pleasant. 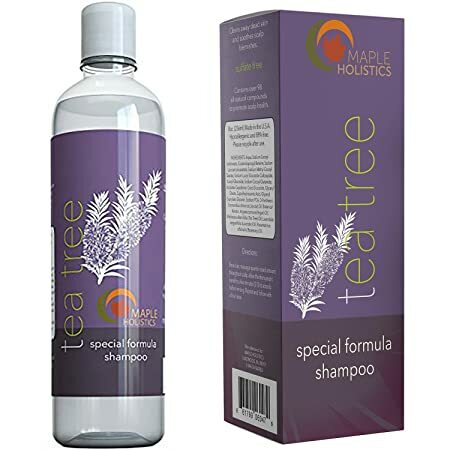 The Maple Holistics Tea Tree Shampoo is an affordable option that uses tea tree and lavender oils to hydrate and moisturize your hair and scalp. These ingredients also work to help prevent dandruff and stop the growth of bacteria on your scalp. In addition to this, the shampoo stops lice and prevents the thinning of hair. This sulfate-free shampoo should be massaged gently into your hair for a few minutes to ensure the best results. 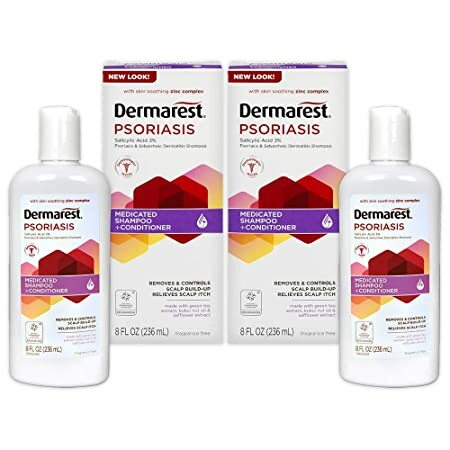 The Dermarest Psoriasis Shampoo comes in a pack of two and contains conditioner. These 8 oz. bottles contain a 3% salicylic acid and zinc formula which work together to stop irritation and redness. It’s also fragrance-free making it an ideal choice for those looking for a simple psoriasis shampoo to try out. 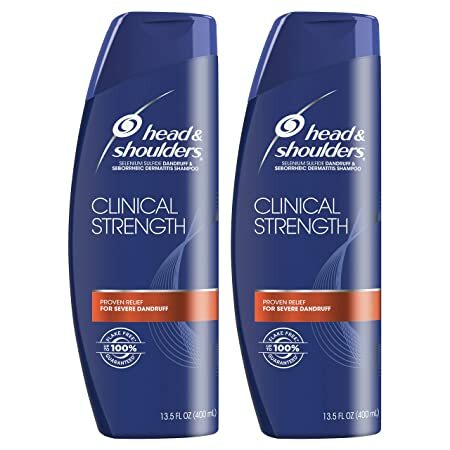 This affordable shampoo by Head & Shoulders comes in a 13.5 oz. bottle. This anti-dandruff shampoo option contains 1% of selenium sulfide to help with removing dead skin cells and moisturizing the area affected. This shampoo can be used on all hair types, although be careful using it if you have sensitive skin as it might cause a little irritation. The Healthy Hair Psoriasis Shampoo can be used to not only heal psoriasis, but eczema as well. This shampoo contains emu and jojoba oils which stop itchiness, dryness, and any inflammation you have on your scalp. It also has high levels of menthol and zinc to help hydrate your scalp and make sure its pH levels stay balanced. The shampoo can be used safely on color-treated hair. This organic psoriasis shampoo is a little pricey, but it’s packed with helpful benefits. 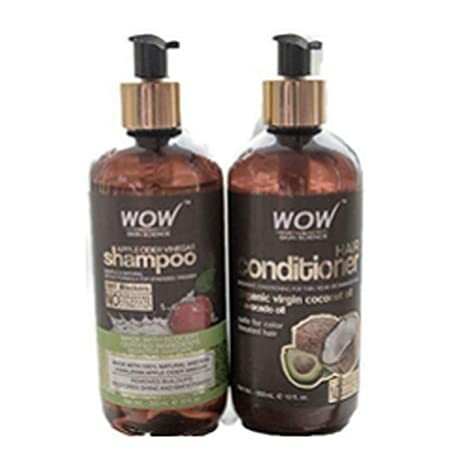 This product comes with both a shampoo and conditioner which are in 8 oz. bottles. The formula is sulfate-free and contains aloe vera, coconut oil, and Manuka honey to help with hydration and reducing dandruff and redness. It also has a 5.5 pH balancer which will help to keep your scalp healthy. This affordable psoriasis shampoo comes in an 8 oz. 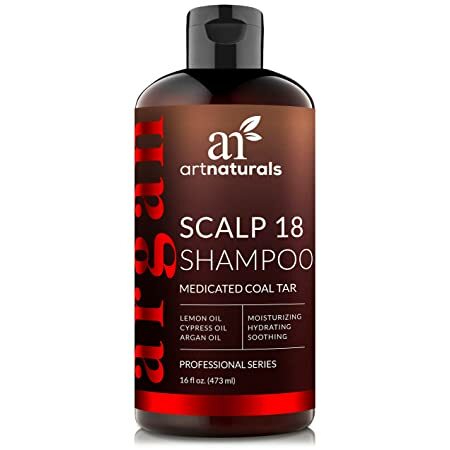 bottle and contains natural ingredients like carrot extract, jojoba oil, and aloe vera to help with hydration and to stop itchiness and redness on the scalp. This shampoo contains no fragrance and is a very simple choice making it ideal for those who want something easy to use. 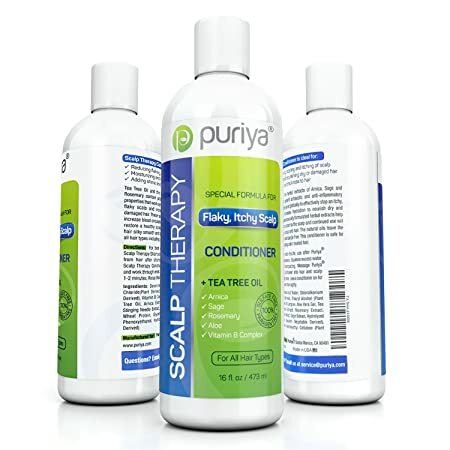 The Puriya Psoriasis Scalp Shampoo gives your hair a conditioner treatment to help with hydration which can stop the problems psoriasis and dandruff can cause. It contains tea tree oil and arnica to help with this and has no chemicals in it which makes it a safe choice for those who have sensitive skin. This product can be used on all hair types and will give your hair a stunning shine in addition to providing relief. 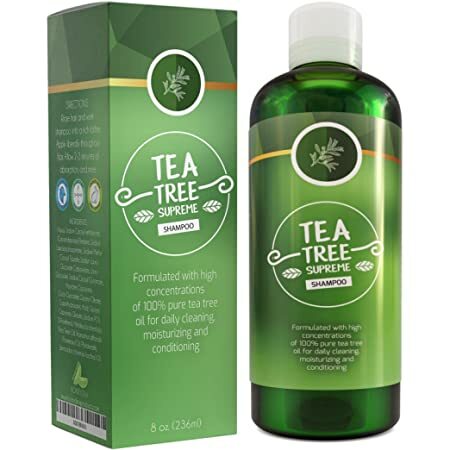 The Honeydew Tea Tree Shampoo contains high levels of tea tree oil to help with removing dead skin cells and bacteria that cause psoriasis from your scalp. In addition to this oil, you’ll also find rosemary and jojoba oils mixed in which help with hydration and to give your hair a soft feel and stunning shine. This hypoallergenic shampoo can be used on all hair types, including color-treated hair. However, keep in mind you might need to use it for a bit before you start to see results. 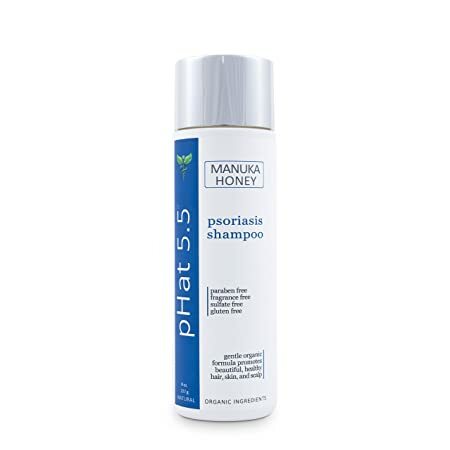 This shampoo by pHat 5.5 is an organic option that works to stop inflammation, dryness, itchiness, and dandruff with its powerful ingredients. In it, you’ll find a soft mixture of Manuka honey, aloe vera, and shea butter which will provide relief to your scalp while stopping the symptoms of psoriasis. This shampoo is paraben-free but it’s not the strongest option. Because of this, it’s ideal for those who have just a small psoriasis problem on their scalp. 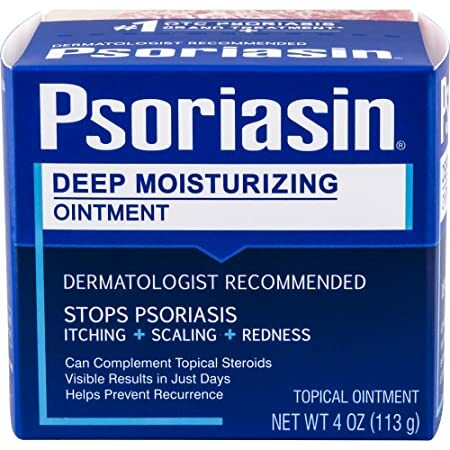 The Psoriasin Ointment Shampoo comes in a 4 oz. bottle and is designed to work quickly to heal psoriasis symptoms on your scalp. This shampoo works quickly and can help to stop the symptoms you’re having from reoccurring. The product contains coal tar which works to remove dead skin cells that cause problems. While it works quickly, keep in mind it might be a little thick so you’ll need to spend some time making sure you wash it well out of your hair. This psoriasis shampoo by WOW Skin Science contains apple cider vinegar to help remove bacteria from your scalp that can cause psoriasis. This antibacterial is a vegan option has a pump on the top to help make it easier for you to use it. While a bit pricey, it works to cleanse your scalp and restore its natural pH levels. However, because of its strength, it’s ideal to not use on thin hair. The Nature Sustained Organic Shampoo contains soapberries, lime extract, and pineapple extract to help heal any symptoms of psoriasis you might be having. It also has probiotics mixed into it which help with removing harmful bacteria from your scalp and hair. This cruelty-free shampoo will work to moisturize your scalp and is safe to use on sensitive skin. 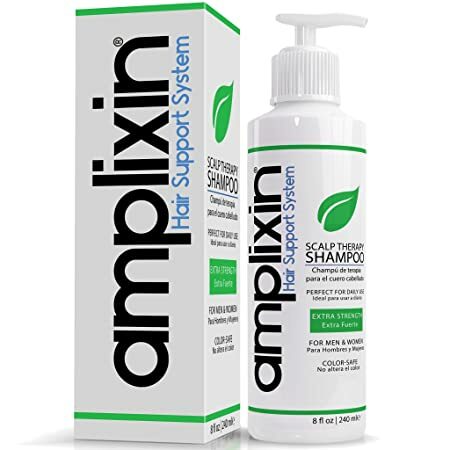 The Amplixin Psoriasis Shampoo is filled with many ingredients, like caffeine, aloe vera, peppermint oil, tea tree oil, and red clover oil to hydrate and cleanse your scalp. There are also DHT blockers in it which work to help stop hair loss that could be caused by psoriasis. 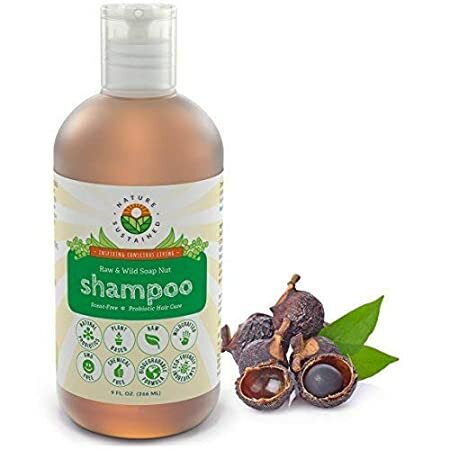 This sulfate-free shampoo can be used on all hair types although keep in mind that for those with very thin hair it could cause slight scalp dryness. Psoriasis can be an irritating problem, but you don’t have to let it bother you any longer. By investing in a psoriasis shampoo, you can easily stop this problem from ever occurring again. So, if you’re looking for a way to help heal and prevent psoriasis, definitely keep our top products in mind. They’ll not only help to stop psoriasis, but give you beautiful hair as well.